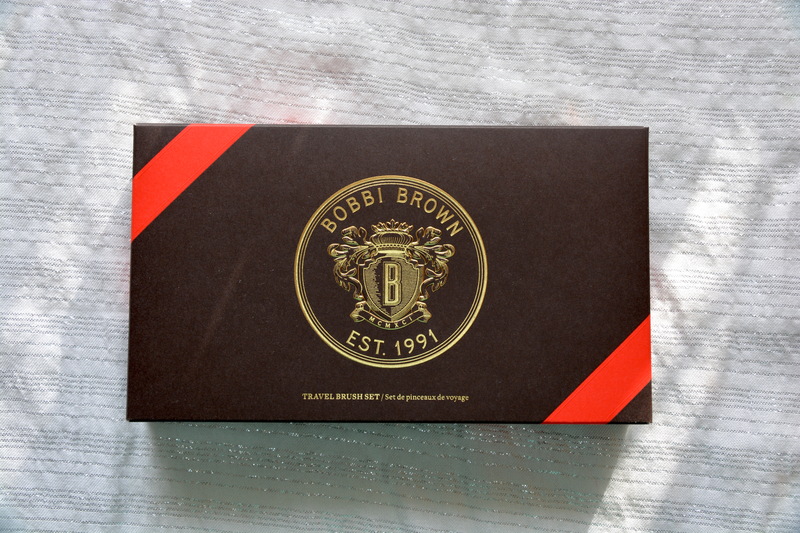 When I saw this Travel Brush Set at the Bobbi Brown counter I knew it had to be mine. Then Debenhams had their spend £50 get £7.50 worth of points deal on and it fell into my basket! Up until this point I had only tried one brush from Bobbi Brown and that was her Eye Blender Brush and I was seriously impressed with the quality. 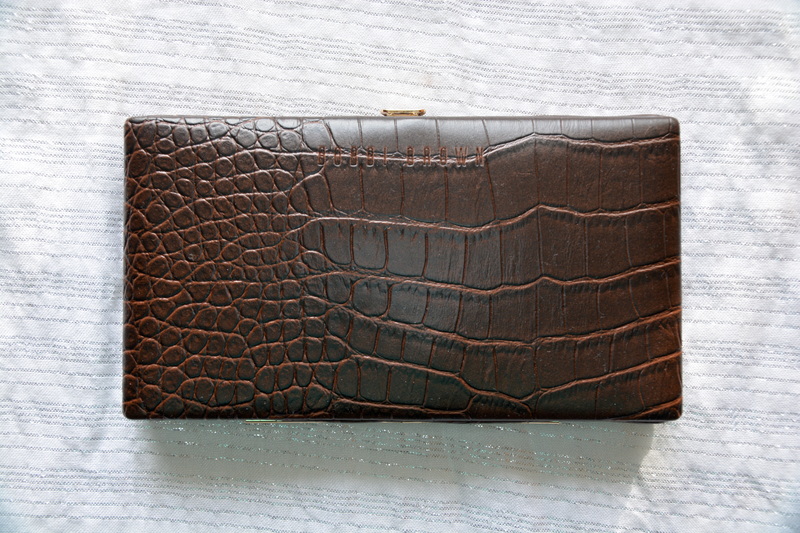 The brushes come in a beautiful mock croc clutch style case which is very sleek so would easily fit in your hand luggage or main luggage. Once you open it up there are two suede pockets for the brushes to slip in to. This is the only thing that I am not as keen on about the packaging. I will explain why. 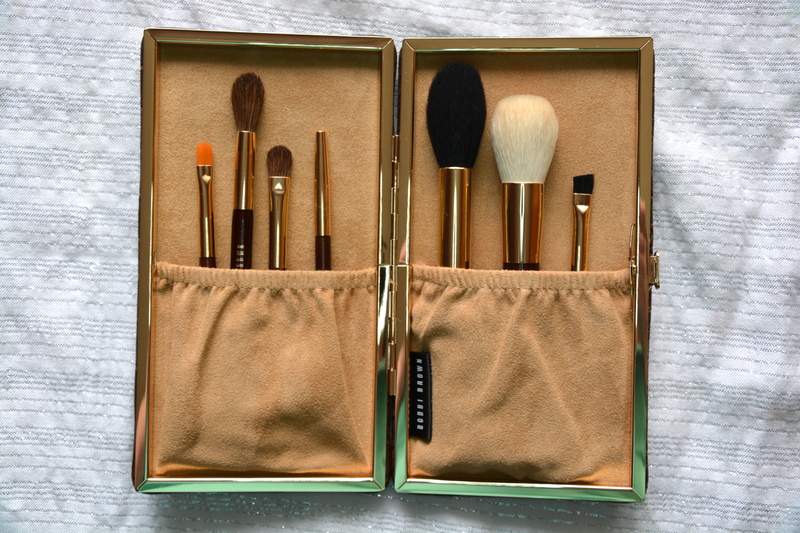 If you are travelling you don’t necessarily want to be cleaning your brushes every day and personally I would want to keep my brushes in the case the whole time I am away. So this means all of the makeup will transfer onto the suede – not good. So to combat this I have slipped some kitchen roll into the pockets then the makeup will transfer on to that instead of the suede – problem solved. This set comes with seven brushes – one is double ended so eight really – that range from face brushes to eye brushes. You can create a whole face look with the brushes included in the set which is what really sold it for me. It comes with the Eye Liner, Eye Blender/Concealer, Eye Shadow, Ultra Fine Eye Liner, Sheer Powder, Face Blender and Eye Brow brushes. Each brush is the perfect size for travel without being so small they are impossible to use. Eye Liner – I have not tried this for eye liner yet but what I have been using it for is to place shadow along my lower lash line. It is the perfect size for this and you can turn it on its side to blend the shadow out slightly. Eye Blender/Concealer – having already tried the Eye Blender I knew this was perfect for putting colour into the crease and blending it all out. The Concealer brush is great for spot concealing or concealing larger areas of the face. You could even apply cream eyeshadow with this brush. Eye Shadow – this brush is fluffier than I am used to using for eyeshadow but it is great for packing colour all over the lid and can also be used to blend it out as it is fluffier than a normal shader brush (e.g. MAC 239). Ultra Fine Eye Liner – I have only used a really thin eye liner brush (e.g. MAC 210) or an angled brush (e.g. Sigma E65) for applying gel eyeliner in the past, but I am seriously impressed with this brush. It is perfect for creating a really thin line along the upper lash line and it helps get the liner right into the roots of the lashes. Sheer Powder – this is a really multi tasker. I have been using this for powder, highlighter, contour, blush and it works equally well for all of these tasks. It is not a soft as my Hakuhodo brush but it still feels lovely on the skin. Face Blender – I saw Tanya Burr using this in one of her videos and was interested to try a brush like this for foundation. I have really enjoyed using this for my foundation and I find it blends product into the skin nicely and you can get a sheer or full coverage using this brush. Eye Brow – when I saw this brush I thought it would be the one I wouldn’t use. The hairs are quite coarse and it it quite thick, not like a normal angled brush. However I love this brush for filling in my brows. I have naturally thick brows so do not really need to do much to them so this is perfect for me. However, if you need to or like to fill your brows in more then this is probably not the brush for you. Overall I am so pleased with this brush set and will probably use it when I am at home as well as travelling as the brushes are great quality and I just love them. 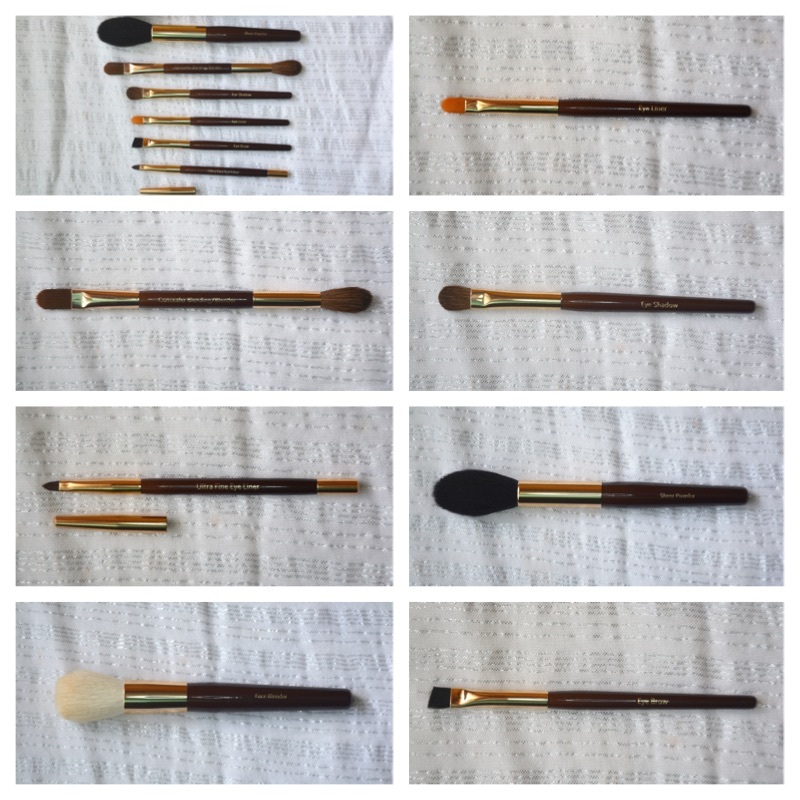 I think this would make an excellent Christmas present for a girl who travels a lot, or for a girl who is looking to expand her brush collection. It is on the pricey side but essentially you get eight brushes for £89 – so just over £11 a brush. Bobbi Brown Travel Brush Set retails for £89 is available from bobbibrown.co.uk, Debenhams, John Lewis and other retailers. It is currently on sale for £80.10.